The ancient legend, but not an eyewitness account, relates that the governor Dacian was doing his utmost to stamp out Christianity in his domain. He killed 18 believers in Saragossa in 303. It was during these persecutions under Emperor Diocletian, that Vincent, the bishop, and the priests were arrested, led away in chains, and imprisoned in Valencia. Because Valerius suffered from a speech impediment, Vincent acted as his spokesman and, on behalf of them all, boldly declared their allegiance to Christ. 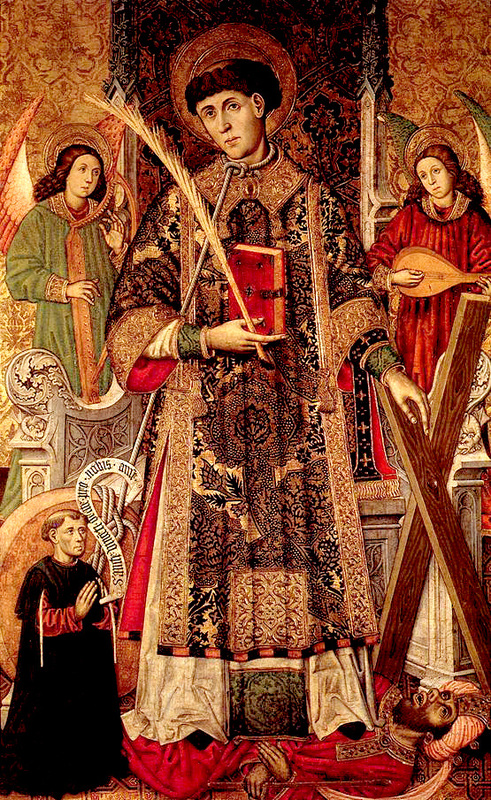 Saint Valerius was exiled and later may have died as a martyr. Vincent underwent terrible tortures; he had resisted turning over his church’s sacred books, and sacrificing to false gods. He was stretched upon a rack, torn with metal hooks, and laid upon a frame of sharp iron bars heated from beneath by fire. When even this diabolic cruelty failed to break his will, he was thrown into a dungeon the floor of which was strewn with broken crockery that added to the agony of his already lacerated body. Vincent declared that God sent the angels of heaven to comfort him. His cell, he said, was illuminated with a heavenly light, and might have been filled with roses (the gift of scent), so sweet was its fragrance. He sang hymns as he suffered, so that even the jailer was astounded. As he looked into the cell of the tormented saint and saw him upon his broken knees, suffering agony yet singing praises to God, he was overcome by wonder, and confessed in that hour his conversion. On hearing this, the Roman governor was infuriated, but finding all his efforts to unnerve his victim were useless, gave orders for the torture to stop–perhaps to win Vincent by clemency or to prevent him from becoming a martyr. For a time Vincent had some relief. The faithful were permitted to gaze upon his broken body, probably in the hope that they would abandon their faith. Instead, they came in troops, kissed the open sores, and carried away as relics cloths dipped in his blood. The gentle hands of Christian women tended his wounds. But he did not survive long and died of his injuries in prison in 304 or 305. When he died, the anger of the authorities was renewed and followed him to his grave. His body was thrown into a bog as prey to the wild birds and beasts, but it was strangely preserved it is said by the protection of a raven. When any wild beast or bird tried to attack the mortal remains of the saint, the raven drove them away. Thwarted, Dacian had Vincent’s body tied to a stone and cast into the sea. But in the night it was washed ashore, and again loving hands gave it reverent care and secret burial. Relics were claimed by Valencia, Saragossa, Lisbon (the Augustinian monastery), Paris, and Le Mans. He was the protomartyr of Spain. There can be no doubt of Vincent’s martyrdom. Prudentius devoted a poem to his praise and embroidered acts of his martyrdom have been preserved. The fame of Saint Vincent spread very rapidly and far, as Saint Augustine testifies, in a sermon, that his cultus extended to every part of the Roman Empire and everywhere the name of Jesus was known. Anastasius the Persian (also known as Magundat) died at Bethsaloe, Assyria, January 22, 628. According to his Greek biographer, Magundat was a young Persian soldier in the army of King Chosroes II when it captured Jerusalem in 614. He became curious about the Christian religion, and was impressed by its sublime truths. He returned to Persia, left the military, and retired to Hierapolis. There he lodged and often prayed with a devout Persian Christian silversmith. The religious art that he saw moved him to inquire more and more about the faith. Finally, he left Hierapolis, and went to Jerusalem where he was baptized Anastasius by Modestus and entered a monastery in 621. Anastasius was always the first at all spiritual duties, especially in assisting at the Mass. His attention to pious discourse testified to the sincerity of his soul. He never read about the triumphs of the martyrs without an abundance of tears, and burned with an ardent desire to become a martyr himself. After seven years in the monastery, he was allowed to go to Caesarea in Palestine to visit holy places and preach the Gospel to the Persian garrison. He was arrested there, flogged, and put to hard labor. The governor Marzabanes commanded him to be chained by the foot to another prisoner, and his neck and one foot also to be linked by a heavy chain, and condemned him in this condition to carry stones. Upon hearing of his troubles, Anastasius’s old abbot sent two monks to assist him, and ordered prayers for him. Meanwhile, Anastasius would pray all night. A Jew reported having seen him shining in glory and angels praying with him. The governor called for him again. Marzabanes had received detailed orders from Chosroes: If Anastasius would abjure Christianity by word of mouth, he might choose to return to military service or still remain a Christian and return to the monastery. The governor added that he might in his heart always adhere to Christ, provided that he would but once renounce Christ, privately in the presence of the governor. Anastasius sent back the answer that he would never lie or dissemble. After repeatedly refusing to renounce his faith, he was taken in chains to the Euphrates, where an officer of Chosroes also failed to induce him to apostatize, even with the help of torture: beatings with staves three days in a row. The martyr’s tranquility and patience astonished the officer, who went again to acquaint the king of his behavior. Meanwhile, the Christian jailer gave everyone free access to the prisoner, and Christians soon filled the prison. Each one sought to kiss his feet or chains, and kept as relics whatever had been sanctified by his touch. They also overlaid his fetters with wax to receive their impression. The saint was embarrassed by all this and tried to discourage his admirers. Eventually, together with 68 other Christians, Anastasius was strangled and beheaded at Bethsaloe (Barsaloe) on the bank of the Euphrates. Their bodies were left exposed to be devoured by dogs, but they left his body untouched. He body was laid in the monastery of Saint Sergius nearby, and later moved to Palestine, Constantinople, and, in 640, Rome where they are enshrined in the chapel ad Scalas Sanctus near Saint John Lateran. The monk who attended him took his linen tunic back to his monastery in Palestine. Anastasius’s head was brought to Rome and enshrined in the church of Saint Vincent and Saint Anastasius, both celebrated today. Miracles have been attributed to images of his head, which were approved by the seventh general council (Act. 4). The cultus of Saint Anastasius may have come to England by way of Saint Theodore of Canterbury. Anastasius’s vita was rewritten by the Venerable Bede shortly before Bede’s death. 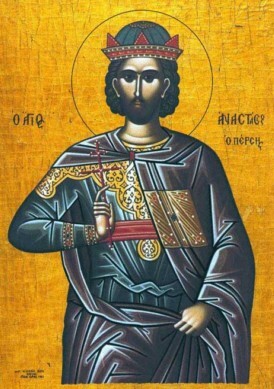 Saint Anastasius is honored the same day by both the Roman and Orthodox Churches. Lesson from the Book of Wisdom. The souls of the just are in the hand of God, and the torment of death shall not touch them. In the sight of the unwise they seemed to die: and their departure was taken for misery: and their going away from us for utter destruction: but they are in peace. And though in the sight of men they suffered torments, their hope is full of immortality. Afflicted in few things, in many they shall be well rewarded: because God hath tried them, and found them worthy of Himself. As gold in the furnace He hath proved them, and as a victim of a holocaust He hath received them, and in time there shall be respect had to them. The just shall shine, and shall run to and fro like sparks among the reeds. They shall judge nations and rule over people, and their Lord shall reign for ever. God is glorious in His Saints, wonderful in majesty, a worker of wonders. V. Your right hand, O Lord, is magnificent in power; Your right hand, O Lord, has shattered the enemy. Alleluia, alleluia. Ps 144:10-11 Let Your faithful ones bless You, O Lord. Let them discourse of the glory of Your kingdom. Alleluia. God is wonderful in His saints: the God of Israel is He Who will give power and strength to His people : blessed be God, alleluia. We offer to Thee, O Lord, the gifts of our devotion, that they may be pleasing to Thee in honor of Thy saints, and be made salutary to us through Thy mercy. Through Jesus Christ, thy Son our Lord, Who liveth and reigneth with thee, in the unity of the Holy Ghost, ever one God, world without end. R. Amen. And though in the sight of men they suffered torments, God hath tried them: as gold in the furnace He hath proved them, and as a victim of a holocaust He hath received them. Vouchsafe, we beseech Thee, almighty God, that we, who have received food from heaven, may by the intercession of Thy blessed martyrs, Vincent and Anastasius, be thereby defended from all adversity. Through Jesus Christ, thy Son our Lord, Who liveth and reigneth with thee, in the unity of the Holy Ghost, ever one God, world without end. R. Amen.